I’m looking forward to 2007 coming to an end. The past year was one of the darkest of my life. My divorce isn’t finalized; my ex isn’t helping me paying the bills and we’ll more than likely lose our house. The only thing that kept me sane was the fantastic fishing this year. Rain on Friday night brought the streams up, but they didn’t blow out. I looked at the USGS flow data that evening, the Grand was still too high and the Chagrin starting to creep up to 600cfs. The only river that didn’t come up that much was the Vermilion. The V was the only river that I haven’t fished this season. Saturday morning I arrived at the river to only see dirty water. I was stunned to see the river that high because the flow data that morning had it at 220cfs. With the water that dirty I was somewhat reluctant to fish it. The river had a vanilla latte color and I knew running sacs in tandems would give me a fighting chance. I wasn’t the only person on the river that morning as three others were fishing a large pool. These guys couldn't have been more hillbilly – flannel jackets, camo waders and fishing equipment bought from the Dollar store. But, these guys were banging fish and I could see why. They were using sacs about the size of ping pong balls. I still struggled to get one hit and decided to head downstream. The water wasn’t as deep and concentrated on the tailout. I placed two sacs per hook and slowed the drift down. It finally paid off as I hooked into a male. I decided to end on a high note and stop by the local tackle store. I asked for the V’s flow data and the river was at 280cfs and rising. Sometimes the flow data isn’t updated in a timely fashion. It has been rumored that the USGS recalibrated the gauge and that can screw up past readings. I got the pin some new line and headed to the Rocky. The Rock was up, but the water had a better color. During the past few weeks, the Rock has seen some very large fish move in as I heard reports of some anglers landing fish over 15lbs. I knew of some spots that would hold some bulls. But the fishing was just as slow as I managed a couple of fish. I figured tomorrow would be a better day. That evening I checked the flow data and the Grand was going up slightly and leveling out. It was at 1600cfs and there was no way that it would fish for New Year’s Day. Since I hate fishing the Rock on weekends, I decided to fish the Chagrin and it turned out to the wrong choice. The water was perfect as was the flow. But the fish took the day off as I only caught three dark small fish that didn’t even bother to fight - pathetic. I drove back home and stopped at the Rock. I noticed the water was murkier than the previous day. When I walked to the same spot I fished yesterday, I watched one angler standing right in the middle of the river. Fish are always holding in that spot and I bit my lip as I walked by him. Advice to newbies – don’t wade past your knees because fish will often hold right in front of you. With the water being this murky, I was glad I tied larger sacs the night before. I knew the fish would be holding in shallow water. I set the float at 3’ and drifted right down the middle of the current and along the seams. Unlike the Chagrin, the Rock had a fresh run of fish. It was a mix bag of hens and males. 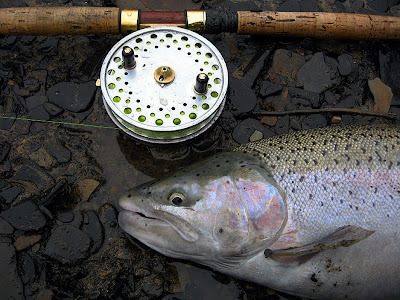 The section I fished today has changed radically over the years as it often happens on Steelhead Alley’s streams. It was twice as wide and several deeper holes have filled in. But, it still holds a lot of over wintering fish. Tomorrow it’s back to work and I doubt I can weasel my way out of work early. I was hoping to fish the Grand on Tuesday, but I think the Rock will have to do.